The first time you see Asher Bradshaw in a skatepark, with his oversized tee, oversized shorts, oversized board, oversized helmet and oversized pads, you just think he is “cute”. You just want to take him in your arms and go play hide and seek with him. However, after the first drop “cute” evolves into “respect” and ultimately into “TrhAsher”. No, the cop is not writing a ticket, he is taking a video of Asher! Can you beleive this???? Belvedere skatepark. When Asher skates, the rest just stop, shut up, stand up and watch. The day we did the interview at Belvedere, a cop came by to inspect the park. He first went to check the trash and then thoroughly inspected below the bleachers, probably to verify that no kind of “substance” was hidden there. Regular cop stuff… Then he came to see us, because there was a kinda mob and all were watching Asher. He just stayed there a couple of minutes totally amazed and started to take pictures with his cellular phone and ended joking with us… Talking about an ice breaker! Most good skaters that I know have to train hard to skate at a very good level. Over and over again! The little guy was just born to skate. Asher just throws himself inside the huge bowls and does not fear anything, not even fear itself! He has a rare go-for-it attitude, obviously a gift from the Father. ﻿ He’s so rad in his skating that the rare times when he falls, he falls so hard that it even hurts you. Then he cries a minute or two in daddy’s arms and go back to the banks as if nothing really happened. I first met Asher at Belvedere in September 09 where he was coming with his dad, Tom, from their Los Angeles home, in the good part of South Central. At that time, he was already good but not rad. Not yet! Well, he only had 4 months of skating. Asher actually learned to skate at the old Venice Skatepark. Watching others roll around, he tried out his daddy’s board (Tom) going down a hill there. From there, Tom bought him a board and they would go to Culver City to try out the "big" hills! 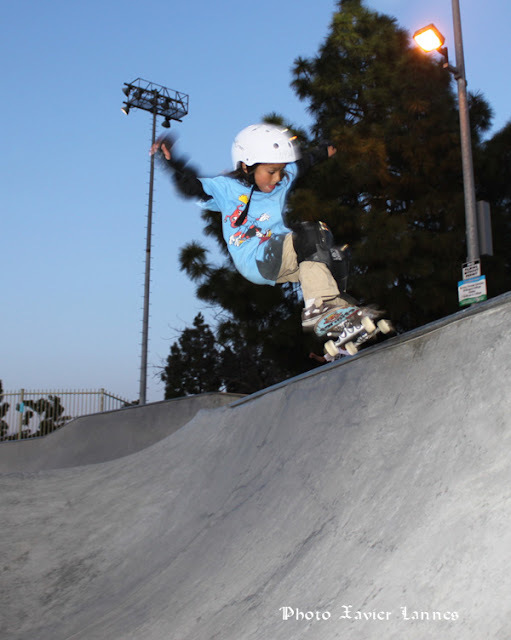 Within one week, he dropped his first coping at Petit Park in the Valley off of Victory Blvd. His first pool drop was at Belvedere the second week. At that time, he only went way up and down the deep end -- i.e. he could not do a 180 yet. Asher is a complete athlete: he was a swimmer first and foremost and skating was only a footnote or distraction then. Now, well he skates more than he swims but enjoys the water still and will compete next summer as well. 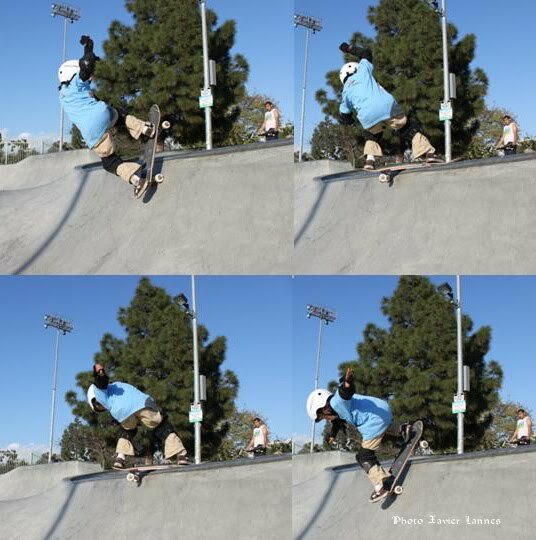 Tail tap over the spine. Even though he purely skates for fun this is already the second skate interview of all his life. The first one was with Jeff Ho for Juice Magazine (to be published soon-I guess). 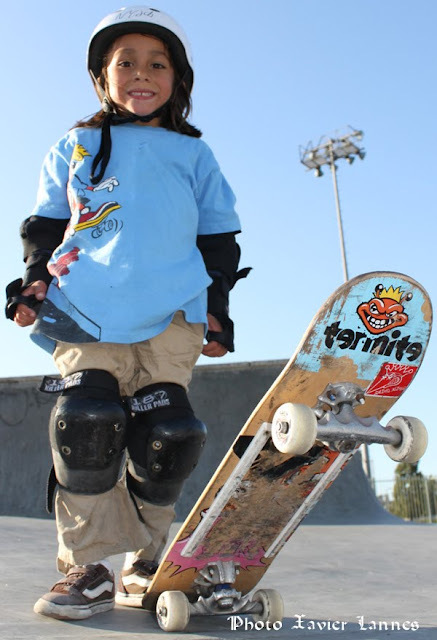 Enjoy his kind words; those are the words of a fun “cute” skater soon to become a “ThrAsher”! One wheeler over the coping. Could you do this at 6? ﻿ When is your birthday? So, that makes you only 6 years old! 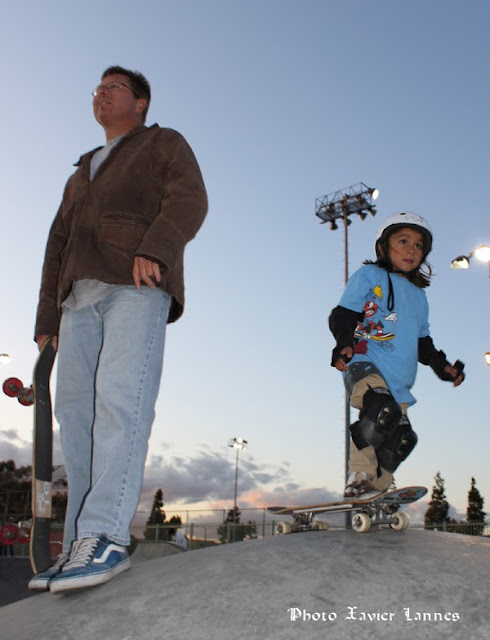 When did you start skateboarding? Asher: I started last May. You have been skateboarding for only 9 months? You have an amazing level for 9 months of skateboarding! Why did you start? Asher: Because I want to be a skateboarder. I want to be a pro. 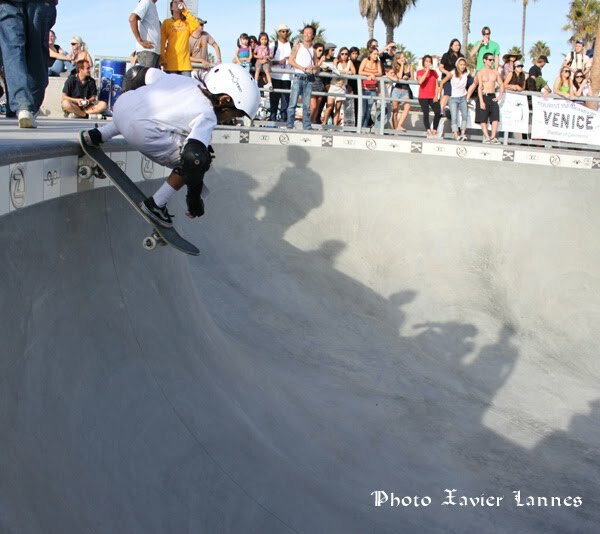 No-one had skated Venice before the opening? ﻿ So, before going to Venice, you were coming here to Belvedere? Tom:No, we were going to the old Venice park before the new park opened. It was at Venice that the seed started. I just think it was such irony that the old park was considered by many to have nothing to skate but for us was everything we needed, much more was to come from the simple act of playing at the beach. We also went to Culver City. At that time, he could not pump. So when you can’t pump you are going slower. Asher: My first drop was at Belvedere, on the big pool. 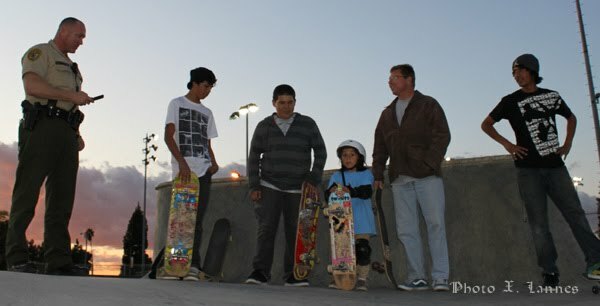 Tom: Asher was raised on the Santa Monica / Venice culture before he skated. Being a lover of the Venice lifestyle means being accepted by those who we respect, admire and wish to know. We skate Belvedere only because we have no time during the week to make it to Venice, plus the weather is colder at the beach right now. 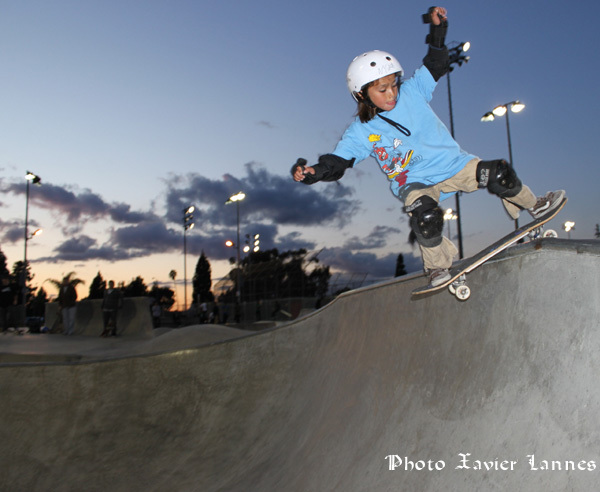 Asher skated the Cove as well but haven't been there lately because the days are shorter and CHARTER SCHOOL! Tom: How about Shane (Borland)? Do you meet Shane a lot? What skatepark do you prefer? Asher: I prefer Venice, I go everyday. Tom: No, we don’t go everyday. and it's only a Termit board!!! ﻿ How many contests have you done? Asher: 8 or 9, but mostly those were events. Tom: He did the King of the Grom, the Venice Massacre, the Castle competition at Skatelab and another Castle competition at Woodward, the street section, Northern California street at 9:00am, then that’s same days at 4:00pm, they did the mini-ramp. He got 1st place on the mini-ramp out of 18 kids, it was 12 and under, so he really did good Then he did the pool and he got 3rd place for that… He was bustin’ airs out of the hips, with 45sec, he didn’t get time to show off his stuff over the spine. Then at 10:00pm at night he did the vert competition in a 13foot megaramp, so he was dropping in that and rock’roll fakies on that one. That was fun. Asher: I got 5th. We also went to Skatelab, but you don’t see the name on it. Do you know you are already famous? Do you know how many people know you? In what grade are you going? Asher: 1st grade. I am going to a Charter school. Tom: So much homework.... Asher does lots and lots of homework....much, much more time is spent doing homework than skating right now. ﻿ Do you like doing homework? Asher: Yes, I like school because I like to learn new stuff; I like both reading and math. Do you prefer school or skateboard? Do you prefer vert or street? Tom: After the first Castle competition, he was in the 1st place for the Southern California 8 and under street. ﻿ What’s a trick that’s hard to do? I see your pads are big. Would you like if they made pads you size? Asher: No, those pads are not big, they are for gromies, they are for kids. Who do you like to skate with? Christian Hosoi and Asher Bradshaw: born to be wilde! I saw a picture of you with Christian Hosoi, do you know who he is? Asher: Yes, he does big airs…. And Christian Hosoi, he sounds like a Christian, he loves God. Tom: Not for the last couple of weeks. That’s my fault, we were out of town. We do read the Bible tough. Apart from Christian Hosoi, who else did you meet? Tom: He also met Jake Brown, Danny Way… We got to meet those guys who are big mega ramp skaters, so that was pretty cool. Asher: I like the mega ramp. Do you know what Danny Way has done? Asher: Yes, he took a picture of me! He does 360 in the mega ramp, drop in the mega ramp, lots of air. Do you know he jumped over the wall? ﻿ Did you go to the Xgames? Asher: yes, yes yes. I liked it. Next year you will participate? Asher: Kindof, if we have time, because if it is late, then we can’t go. If it’s early then we will go. Did your daddy teach you a lot? (Laugh) So, your daddy is not a skater? Asher: Yes he is! But when I try hard tricks he teaches me how to do it and then I watch people do it and try to copy them and then my dad helps me and teaches me how to do it. Is there something special you want to say? 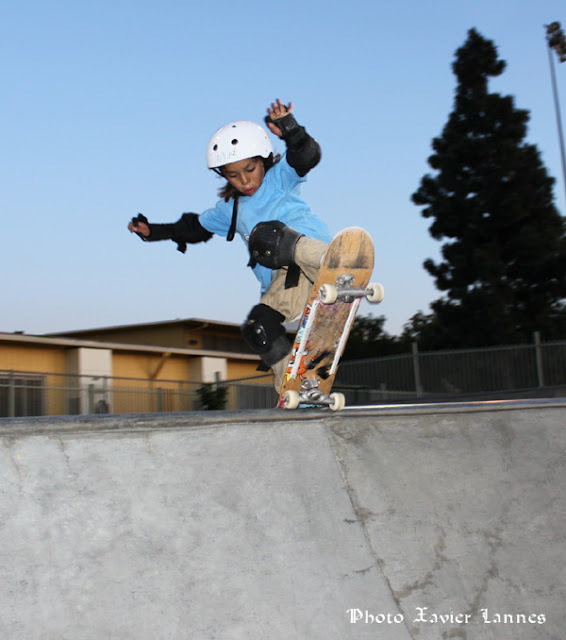 Asher: I like skate because it's fun. Thank you daddy. 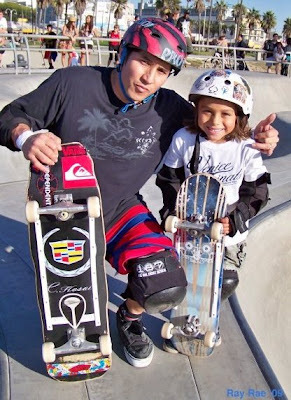 Photo of Asher and Hosoi: Ray Rae Goldman (used by permission). All other photos: Xavier Lannes. She got some skills ! and He is so damn cute! Asher was killing it in Venice this June - was stoked to shoot the Z-Flex session with Asher, check out http://www.flickr.com/photos/philipfield/tags/asherbradshaw/ for pics.